Stir eggs into buttermilk and add to dry mixture. Melt butter inside heavy iron skillet. Coat skillet with butter on all sides. 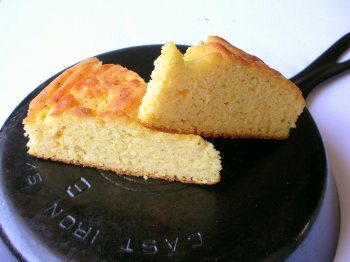 Pour remaining butter from skillet into cornbread batter and mix thoroughly. Crumble bacon into small pieces and mix into the batter. Pour the cornbread batter into hot skillet and bake in a 375 degree oven. Cook bread until it has a golden brown crust (approximately 25-30 minutes). CHEF DU JOUR RICHARD JONES SHOW #DJ9465 Busted and entered for you by: Bill Webster Converted by MM_Buster v2.0m.